Item number Na946 from the MOA: University of British Columbia. Yellow owl with outspread wings holding grey animal in beak. Smiling faces of two girls and three boys surround owl. Curved blue background on brown and green base. 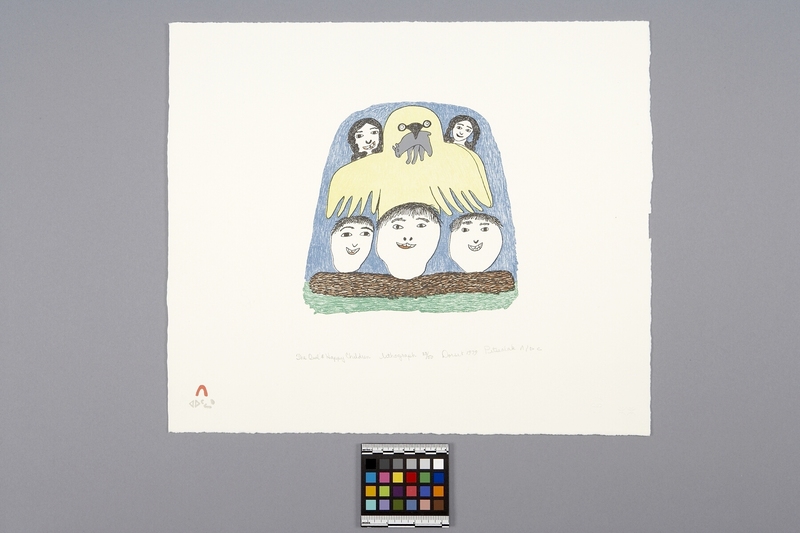 Below image on left: name of printmaker in Inuit syllabics and Cape Dorset stylized 'red igloo' seal, "The owl and happy children lithograph 33/50 Dorset 1979 Pitseolak," name of artist in Inuit syllabics. Canadian Eskimo Arts Council's blind embossed stamp in lower corner on right.